This utility tray eliminates our need to reach for the tools or go up and down the ladder to get the tools we need. We really like how sturdy and wide the steps are. These wide steps are slip resistant, and makes it safe when we are standing on it, as it can avoid slips. This ladder weighs about 18 lbs., and can be easily transported. It is compact and this makes it easy for storage. We like that this ladder is functional and attractive with a modern design so it can be kept inside the home without hindering the space. 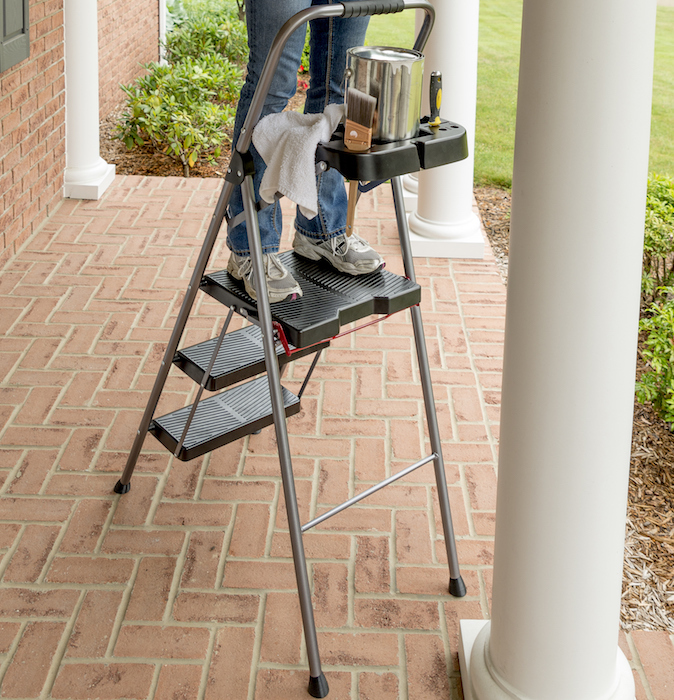 The soft comfort grip and intuitive, secure latch design enhances our stability when we climb and stand on the step stool. This ladder with its ergonomic rubber handle and a gray steel frame has a durable design made with solid steel and plastic construction. This stool has a weight capacity of 225 lbs. and a Type II ANSI rating. There is a sale on this ladder, and it is priced at $35 until November 30th so take advantage of the discount. If you are in Canada and would like to win a 3-Step Project Ladder Step Stool value of $70 enter the giveaway through the rafflecopter below before December 3rd. Please leave comments and follow my social media networks to be eligible to win. Ontario... I would love to win this to use in my kitchen. I am so short - lol - I can't put items on the top shelf without a ladder. I am from Manitoba and would like to win this because it would help me to reach items from the top shelf of my cupboard, and its good to have one on hand, you never know when you may need one. I want to win so I could give it to my Dad, this would make things easier for him when he needs to use a ladder. I am in BC and this would come in handy with 9 ft ceilings. I am from Ontario and I could really use this myself because I am always asking my husband to do stuff for me just because it's a pain to reach. I'm in the Niagara region of Ontario! I'd love to win because this looks like the most handy household step stool I've ever seen! I live in Toronto! WE currently do not have any ladders and always h\ave to borrow from a neighbour! So this would be great! Newfoundland Canada. I would love to win for my hubby who is always getting up in the attic on a chair. Thanks! I live in Ontario and this ladder would help with my chores. I live in Toronto, Ontario and would love to win this ladder to help me clean my outside windows. I am from Ontario and would like to win this so I can get the work on the outside of the house finished. Ontario and I just saw what my husband rigged up to paint our hallway and I now fear for his life. I live in Nova Scotia and I often have to wait for my husbands help to get something down safely from the top shelf in our storage room. I live in Notheren Ontario. I need a new little ladder because my hubby is a handy man and left my ladder like this one at a cottage he was doing work at and never got it back. I live in Newfoundland and I would love to win this to replace our old falling apart wooden stepladder. This one sure looks safe. I am in Sudbury Ontario and I could use this because I am too short to reach the cupboards. I live in Manitoba, I would love to win this for my husband to use as he does repairs around the house. I live in Thunder Bay, and I'd love to win this for the projects I need to do around my house! i am in BC. I could really use one as I use a chair..dangerous and this would be so much easier around the house! I live in Ontario and I want to win this ladder for my husband as he does a lot of work around the house and I'm sure this would be very useful for him. I live in Ontario and this would be perfect now that we are renovating. Thank you for the chance. I'm In New Brunswick. I'd like it because my house is tall and I am short. I'm always climbing on chairs to reach stuff. I live in BC and this would be perfect! I'm not the tallest and there are regularly things on top shelves that I have to pull a chair over to grab. This looks a lot easier, and safer too. I am in Toronto this ladder looks sturdy and useful for a lot of projects. I am in BC and I want to win because we have recently put up a lot of shelving in our garage for storage and it is awesome but I need a ladder to reach the upper shelves. I live in Ontario, I would like to win because we don't own one. We have to keep borrowing my son's. I live in Nova Scotia. I would love to win this because We don't have a small ladder and I usually use my kitchen chairs. I'm in Alberta. I am also only 5 feet tall & I don't own a stepladder; I use chairs to help me reach things. There are certain places in the house when the chair is just not adequate to reach like changing lightbulbs in fixtures that I could really use this Werner step stool, thanks! I live in Ontario and I love painting, so this would be super handy. I'm in Ontario, this would be great for trying to keep the cobwebs off the skylight! I live in Ontario. I'd love to win this ladder for my daughter. For some reason she keeps her coffee on a ridiculously high shelf! I live in Ontario and would like to win this terrific ladder for my husband and myself to use for reaching the stuff we store on the high selves in our kitchen and basement. I'm from Alberta! The 3-Step Werner Project Step Stool would be perfect for me, I need something safe to step on and the wide slip resistant steps would allow me to do small project and help reach the top of my cupboard and closet safely. I love the utility tray. I live in Saskatchewan and would love to have this ladder for around the house stuff. Like painting the walls. I live in Ontario. I'd love to win this for all the home improvement projects we have planned after the holidays. I am in New Brunswick. I'd like to win this for my brother-in-law because he told my husband he would like to have one to use around his house. I live in Ontario and this would be perfect for when I need that little extra step up!! I live in Ontario. I would love to win because I don't have a ladder. I live in Ontario. With my husband at 5'6" and me at 5'3", we almost always need a stepladder for work around the house. I live in Alberta and I would love to win because it would be perfect for doing jobs around the house and I could use it for getting things out of the cupboard above my fridge.